While preparing to make a documentary about Stanley Kubrick’s Eyes Wide Shut, Tony Zierra (My Big Break) became increasingly drawn to an integral part of Kubrick’s narrative, his longtime unsung assistant. Putting aside his original documentary premise (now his next film, the upcoming SK13), Zierra instead concentrated on the life and labors of Leon Vitali. Vitali, originally an actor, didn’t suffer from the usual pitfalls of his potluck profession. Instead, he hopscotched through 1970s British TV minus any significant unemployment gaps, earning further credibility from seasonal offers to work for the Royal Shakespeare Company. He responded with the rest of his generation to two spectacular film releases, Kubrick’s 2001: A Space Odyssey and A Clockwork Orange, with awe and wonderment. After seeing the latter film he turned to the person sitting next to him and said, “I want to work for that man.” Within a couple of years he was cast in Kubrick’s Barry Lyndon as Lord Bullingdon, Lyndon’s stepson. Nervous about being fired, a common concern for anyone working for the uncompromising director, Vitali was delighted when his role was bulked up. Kubrick appeared to like him. Conscious of his surroundings in the presence of a master filmmaker, Vitali began to pay close attention to the behind the scenes operations. As the shoot continued, he intimated that he’d like to learn more about editing. Kubrick asked him to give him a call once he’d acquired some skills, which he did. Vitali was then sent a copy of Stephen King’s The Shining. Thus began a world unto an auteur and decades without sufficient sleep. In Filmworker, Zierra allows Vitali to tell his own story in his own way. With enough behind the scenes Kubrick clips to please most cinema enthusiasts, Zierra keeps it simple. Interviews with commentators including Ryan O’Neal, Matthew Modine and Stellan Skarsgard, all of whom hold Vitali in high regard, pulley the film along, as does a tiny amount of animation. Filmworker is also an eyeopener into Kubrick’s ability to entrust in the gifted few - or one. Vitali's service to Kubrick was so exhaustively diverse that he evades a job description, hence the film's title. He is a one-man band, fully equipped for bashing out anything he cares to. He is also, one mustn't forget, a skilled actor who, approaching 70, possesses features carved from graft, wizened and pummeled by his Kubrickian workload. Even though Kubrick regularly ran Vitali into the ground, he never lost sight of his unique value. 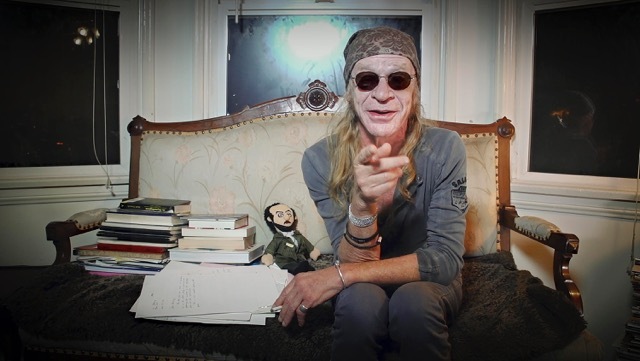 All work and no play has made Leon Vitali anything but a dull boy.